Gio on Guan: If a 14-year-old can, Why can’t I? Golf is an old man’s sport. That’s what we know. That’s what we think. Jack Nicklaus won his 18th major at the age of 46. Jerry Barber, a former PGA Championship winner, played a PGA Tour tournament (the ‘94 Buick Invitational) — at the age of 77! That’s before. In this era of Instagram, Twitter, Galaxy S4 and Guan Tianlang, it’s all young and new. You’ve read of Guan two weeks ago. At 14 years old, he became our planet’s youngest human being to have made the cut in a major championship. “It’s frightening to think that he was born after I won my first Masters,” said Tiger Woods, now “old” at 37. Golf today is about the youth. Ask Jovi Neri. The young lawyer’s jungolf program at the Cebu Country Club has cultivated dozens of champions. 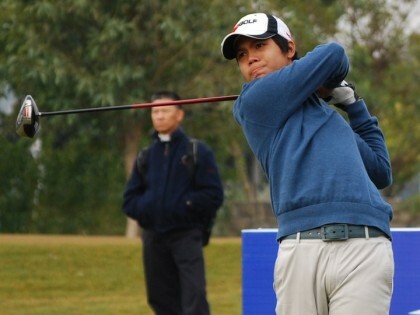 Miguel Tabuena barely lost (sudden death to Jay Baryon) in yesterday’s ICTSI Camp John Hay Championship. He won an event the week before. He’s only 18. Angelo Jose “Gio” Gandionco is another young phenom. The son of Opep and Cora Gandionco, Gio is now enrolled under a golf scholarship at the Santa Clara University in California. A multiple Philippine junior golf champion (and major awardee during the 31st Cebu Sports Awards), Gio spoke about his co-golfer from China. COLLEGE. Our talk shifted to his collegiate freshman year living in America. Thus far, with the Santa Clara U. team, he’s competed in Washington, Arizona, Oregon, all over California and even in Mexico. “Traveling to different places, playing golf and meeting new people is always fun especially when you’re with a team,” Gio said. Santa Clara is a private (non-profit) Jesuit school based in Silicon Valley — the “world’s technological capital” that houses Google, Apple and Yahoo! Gio calls the school “not too big or too small” (about 5,000 undergraduate students and thousands more in grad-school). In golf, they were seven players (now down to five because one quit and another didn’t reach the required grade point average to play as a student-athlete). Gio’s schedule is all academics and golf: “MWF, I have class from 8-12 then golf practice from 1 to when ever it gets dark (which is about 6-7pm),” he said. “On Tuesdays and Thursdays, my team has 6am workouts followed by class from 8-2 then golf practice when it gets dark.” During his slack time, Gio studies and plays another round of golf on Saturdays. On Sundays, he rests.